There are different ways to stimulate your mood, and you are free to choose whatever works the best for you. We are actually doing it all the time, making decisions all day long. Unfortunately, most of the time we stimulate our mood negatively, and depending on the situation the result is — way too often — feeling upset, annoyed, sad, depressed or despaired. Do you really want to feel that way? Using the “Work”, you can mentally manipulate how you feel, questioning and evaluating your thinking. 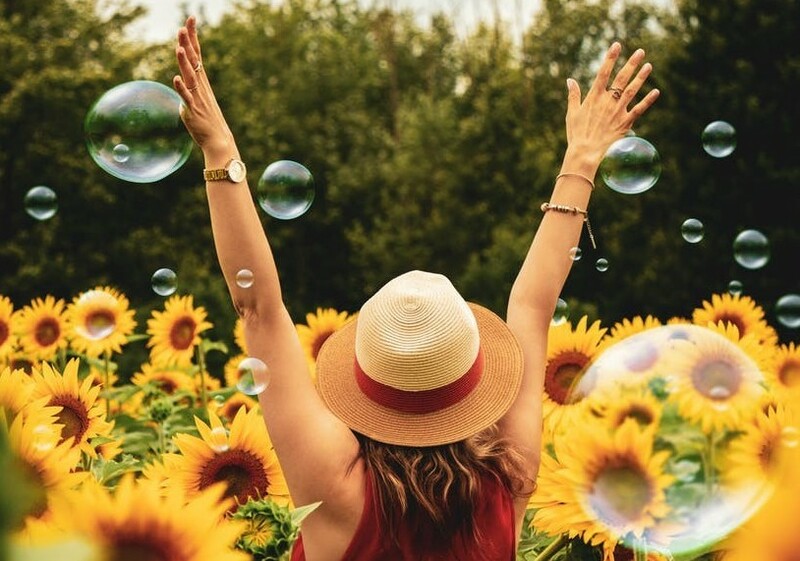 Using the sacred place of gratitude in your heart, you always can activate positive memories, images, thoughts and feeling in your mind, which helps you to shift the frequency of your feeling, your primary energy. Bring in your focus how you really desire to feel, be thankful for and you create that reality. You will feel better instantly. The Technique 3 combines the psychological and physiological aspects of an emotional state. While you are tapping the acupuncture points, you are relaxing your body and mind, and your conscious and subconscious mind will find the best solutions for the issue you work on. 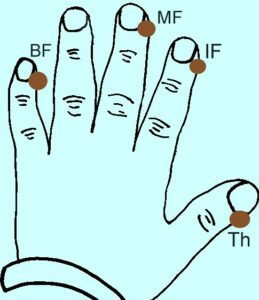 The Emotional Freedom Technique, short EFT, known also as a Tapping Method, was found in the 1970s by Roger Callahan, whereas he was experimenting with meridian or acupuncture points while working with a young mother on her anxiety of water. Roger Callahan was fascinated by the idea using the acupuncture points to influence the meridians — the energy pathways of the body — to heal diseases. The Traditional Chinese Medicine found about a 100 of such points along the meridians. However, he did not see any practical use for them in his work as a psychologist. It was one of his students, Gary Craig, in the 1980s who simplified Callahan’s findings creating a comprehensible tapping system. How Does the Tapping Method Work? Wherever we look, we comprehend our world split up in opposites: black and white, warm and cold, good and bad, right and wrong, and so on, and so on. 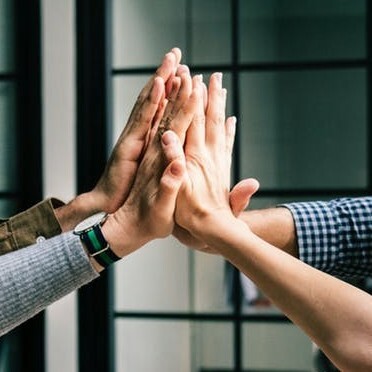 Pleasant or positive experiences like a successful closed deal or joyful encountering mostly trigger positive emotions and thoughts. We are feeling rewarded and blessed. On the other hand experiences which we do interpret as negative experiences, as failure or lack of certain things, set off fear or anger based emotions and thoughts in our system. Short: We are feeling bad! While you are tapping on certain acupuncture points, your nervous system is slowing down, calming down the brain and the nervous system. In the state of more peace and quietude, we extend our possibilities and are able to feel, think and act in better ways. In that state we will find more ideas, more solutions, more motivation and new ways — for whatever reason — to coping with our environment. We will find ourselves more inspired about what we want to accomplish. We will find ourselves more in alignment with the Universal Laws. The Tapping Method is focusing on mental, emotional and physiological symptoms, not only calming down our system, and opening space for modifications. The Tapping Method also helps to relax your body, supporting your acceptance and willingness to change undesirable emotional and cognitive states. How to Apply the EFT? The first off – similarly to the Technique 1 – you will choose the issue to working on it. This could be as in Mary’s case: feeling depressed for no reason. So, first off, choose the topic you will work on, please. Then connect to the underlying feelings of that topic. Feel it! See it, if there is something to see! Hear it, if there is something to hear! On the scale from one to ten, and on that scale the number one represents the smallest degree of feeling depressed (or of what you have chosen to work on), while the number ten shows the highest possible degree of feeling depressed, choose the number, please, that represents how you feel before starting with the tapping process. Don’t think about it, just pick the number that jumps first into your mind. Even though, I’m feeling depressed for no reason, I deeply and completely love and accept myself. During the session with EFT you will activate nine tapping points along your energy pathways. 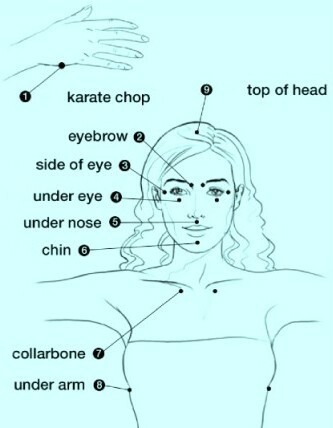 The starting point of the process is the “karate chop” at the side of your hand. 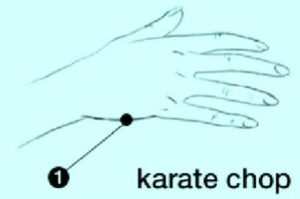 Use the karate chop of the left hand if you are right-handed, and the karate chop of the right hand, if you left-handed. Even though, I’m …………………………………………………., I deeply and completely love and accept myself. Please, tap slower to calm down if you are upset, and faster if you need an energy boost. Continue tapping at the second point: “the eyebrow” while you are saying your sentence aloud one time. Tap all nine points saying your sentence aloud one time on each point. For the tapping you can use your index and middle finger or four fingers of your hand. You can also use the index or middle fingers of your both hands to tapping. You can also choose to activate the tapping points on one or both sides of the body. Both ways work well. I prefer to activate the tapping points on both sides. After you finished the first round of tapping, please take a deep breath. Yeah, good job! Take a deep breath two more times. Exhale slowly and consciously. Please, on the scale from one to ten choose the number that matches the best how you feel right now. Are you feeling better? Great job! Do the process, please for two more times, and evaluate the result. If you content with your result, relax for a while, otherwise do the tapping for two more rounds. Be aware how do you feel after the tapping process. Take your time. It is your healing you are performing right now. You are taking care for yourself! 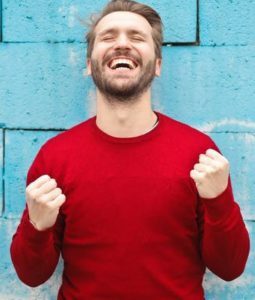 Remember, that you always can use this technique for improving your mood and your situation. You will find back to peacefulness and freedom, and you will be able to make better decisions. If needed, you can use this technique very discrete applying the tapping points on the side of your fingers of your both hands. These points work absolutely awesome in exam situations, interviews or public speaking. Please, experiment with the technique and get the best out of it! You Are the Master of You Thoughts and Emotions! I hope you enjoyed your journey and gained a lot of insights! In my opinion, the most important insight is that you are not a victim of your emotions and thoughts! You are the Lord of them. They are not happening to you! You are actually creating and then experiencing them. At that moment you take the responsibility for your own emotions and improve them, you simultaneously contribute to improve the entire energy surrounding you with an enormous influence on your life. The methods I presented to you are simple, and you can always apply only a part of them in a very short time. You can use one of your favorite tapping points that works for you the best, and apply it if needed. You can always recall moments of gratitude. You can always question your thoughts if they are supportive or if they weaken you. From now on you can always determine how you feel and think about yourself or the situation. Thank you so much for reading my blog and applying the methods! It makes me feel happy! Please, write down a comment how you experienced the process. Which aspects of the three methods were especially benefiting you! I would love to learn more about it, and offer you the exact support you need! I’m looking forward to seeing you in my next blog. Continue to read here. This entry was posted in EFT, Tapping Method. I love EFT…it is such a wonderful tool. You have written a very concise overview about it -its origin, it efficacy, and its method. I used tapping to help me ‘move through’ the emotions associated with my divorce and it was the best thing for me at that time and space. It really is about self-acceptance, inner trust, and belief. You have to love yourself enough to effect change and you are the only one who can when it comes to you. Great article and keep up the good job. Thank you again for taking your time and reading my article. I use EFT for aver 11 years. The most impressive result for me was, getting rid of my hay allergy. Mahalo for sharing your experience! Hello Jenna, great article. You are right about that last part with us controlling our own emotions; that really dictates our future. Thanks! Thank you very much Evan, for taking time and reading my blog. Yes, our life patterns are following our patterns of emotions. We cannot control our life. But we CAN control our emotions! Please, let me know if you have any questions! I’m looking forward to assisting you!